Marketing is a many-chambered house. We hold all the keys and have the ground plan too. A post mailing, a web banner, an event… the ways to get a message across are legion. At Castel, you will find a one-stop shop for all your marketing activities, and can rest assured that they are always perfectly attuned to each other. Marketing is not an exact science, but not free expression either. Pithy marketing is simply impossible without a good dose of creativity – but will in turn produce optimal results through a pragmatic and methodical approach, to bring your project to a successful conclusion, on time, and in budget. Castel is not a rowboat, but no oil tanker either. We have all the requisite experience in house to steer you through the choppy waters of even the most extensive campaigns. Yet, thanks to a permanent staff of twelve professionals, we remain nimble enough to anticipate and respond proactively to all your questions. Castel is active in the Benelux, with offices in Belgium and the Netherlands. Castel is your one-stop shop for a wide range of marketing activities. In plain terms, you can count on us for every phase of your project. And we are particularly keen to take up the challenge of devising your total project, from idea to completion. Finally… nothing drives your message home as much as the force of repetition. Such repetition need not be identical, however. To follow up your campaign, we go through all the steps of the process once again and make adjustments as and when necessary, thereby enhancing efficiency in systematic fashion. You can call on us for a comprehensive marketing analysis that gauges the market situation, your product, target group and budget with painstaking precision – one that can serve as an ideal basis for a balanced marketing mix. Powerful material is not the end but the beginning of a campaign. Castel accordingly charts the entire course together with you. We put your website online, see to the publication of your adverts or web banners, and dispatch your e-mail campaign. We can also include PR activities in your marketing mix. Should you opt for post mailing, Castel has an in-house production apparatus that can process small and large volumes rapidly. Once the campaign is finished, we assess it, together with you, relying as much as possible on quantitative data (such as the number of clicked and opened e-mails) to ascertain whether the objectives were reached and what (further) improvements can be made. We rely on your briefing and our marketing analysis to get the creative ball rolling. In close consultation with you, we then choose the appropriate communication channels (conventional, electronic and social media), the proper form, the correctly worded message and an arresting image. HP is one of the world’s largest technology companies, providing solutions for personal computing and printing. HP introduced the HP Slice. A very compact, yet powerful desktop PC. A piece of innovative technology that HP wanted to introduce in an effective and smart way. HP was looking for an original tool that its partners could use to acquire customers. A smart new piece of technology deserves an innovative introduction. And a video card was just the right type of smart medium required. It’s an original medium capable of both surprising the recipient and offering added value. The card features a little LCD screen and when someone opens the card, a short video clip plays automatically. You can also write several clips to the card. With its menu and skip buttons, it’s easy for the viewer to zap from one clip to the next. It’s an outstanding tool for presenting a product quickly and clearly. Moving images have far more chance of gaining and retaining the viewer’s attention. Once produced, the video card can then be sent out by ordinary post. Lyreco is European market leader in business-to-business solutions in the field of office products and workstation accessories. The company has a wide assortment of products in stock which can be delivered the next working day. In the Benelux, with its own distribution centre, this results in 1.25 million deliveries a year or 20,000 boxes per day. Lyreco wanted to establish a loyalty programme to stimulate the sale of vendor products to its 350.000 Benelux customers. The company was looking for a transparent and user-friendly system that customers and employees ‘want’ to work with and can thus develop into a valuable communication channel. Castel proposed to build the loyalty programme around an interactive web platform: www.lyrecoloyalty.eu. Customers are able to exchange the points they receive when they buy products for gifts. By bannering and a newsletter, special promotions can be linked to this. To guarantee the success of the promotion, an incentive section for Lyreco sales agents was created. Creation of a webportal (including registration module and webshop) which can be easily and quickly updated with new info. Communication to Lyreco customers to prompt them to register on the webportal (folders, advertisements, e-mails …). Creation and sending of the monthly newsletter, creation of temporary promotion banners, etc. Communication to Lyreco sales agents (personalised introduction package) to tell their customers to register for www.lyrecoloyalty.eu. This also allows them to save points. They can follow their progress on a personal webpage (the sales thermometer). Blokker is a Dutch store chain that sells household items. Blokker currently has 190 branches in Belgium. Increasingly, more and more people are buying online. This is placing quite a lot of retailers with a classic network of physical stores under pressure. Blokker aims to stay one step ahead of the curve by appealing to new target audiences. As an example of this, they realised that young people don’t tend to go to shops like they used to. So they came to Castel to find the right communication channel for reaching this particular group. We quickly decided to focus on students living in digs or shared accommodation, who have left home and who need a range of things to set up their new home. We started off by giving these students a discount card after they registered. We were very targeted in the way we advertised this discount campaign: in student magazines, via loyalty cards in student cafés, posters in points of sale and online via social media. There has been a follow-up to the campaign, too, and we’re also looking at other target audiences. Mobile working has become like a runaway express train in the 21st century. HP aims to act as the locomotive of that train and markets its mobile products and solutions strongly in co-marketing campaigns with a number of partners. Our recommendation to HP was to claim ownership of mobile working solutions for themselves and target business users. To reach this audience, we have gone beyond using just the classic B2B communication channels. The aim is to cast our net as widely as possible, which is why we also include B2C communication. What we did was to set up Dutch-language and French-language websites based on mobile working: respectively mobielerwerken.be and travaillerplusmobile.be. These sites provide a platform that not only features HP products but also offers a range of tips & tricks about being mobile. When they visit the sites, users also come into contact with the participating HP partners. This combines content, product and partners. Various campaigns have already been run to promote the website: on buses, television, radio, Facebook, cinemas and online. This has given us a good picture of the online habits of visitors to the site. Based on the pages they visit, surfers are directed back to the site via remarketing and retargeting. For HP this provides great value for its strategy of further refining its strategy on mobile working. The campaign continues to run and the content is growing. Getronics develops, implements, integrates and manages ICT infrastructures and business solutions to help companies maximise the value of their investments in information technologies. Getronics wanted to send out a periodic electronic newsletter in cooperation with Cisco to keep their target public posted about the latest developments. To secure continuity in terms of timing and content, it entrusted this task to Castel. We make sure that we collect sufficient content on time so that we can send out a relevant and useful edition each occasion. We process the content into brief articles that goad the users to click to the bigger story. Every article contains a call to action to get readers to contact Getronics. Castel has access to the Getronics e-marketing tool so that the newsletter can be drawn up at once in the right environment and made ready for dispatch. HP is one of the biggest technology firms in the world, with solutions for personal computing and printing. More and more people have a need to find solutions for working in a more flexible manner. Teleworking is gaining currency ever faster. People who are often on the road want to remain productive overall as well. We devised a plan with HP to demonstrate some of their premium devices to a professional public on location – an idea that fits in with the mobile working campaign that we pursue throughout the year with various initiatives. Every year, Qmusic moves to the Q-Beach House on Ostend Beach during the summer months. In addition to a studio, the summer residence also boasts a large terrace where people can enjoy a drink and a snack throughout the summer. Castel proposed to turn the Q-Beach House into the finest workplace in the country every Thursday in July and August. Companies could delegate up to 6 people to come and spend a whole day working on HP devices. They had to register in advance via qmusic.be. The action was promoted via radio, the theme website mobielerwerken.be, and posters in catering outlets at the coast. Castel set up a comfortable covered corner on the terrace, where we received the winners with breakfast. We saw to HP branding, devices on which the winning team could work, a tour behind the scenes, a tapas lunch and drinks to bring the day to a close. Every Thursday we were on hand the whole day to make sure that our guests did not lack anything. The finest workplace in the country was no hollow slogan, but a promise that was made good on the ground. 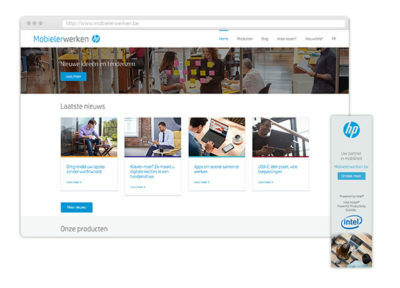 In addition to the finest work place, the theme website (mobielerwerken.be), which we created and maintain for HP, was put in the spotlight. The website is a growing platform for which we plan more related actions. 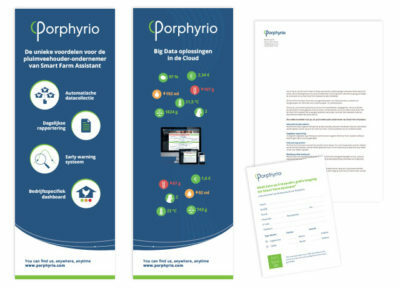 Porphyrio is a high-tech spin-off from KULeuven. The company specialises in developing Business Intelligence Systems for the poultry industry. The software developed by Porphyrio collects data about the production process and the condition of the poultry without the need for any manual input. The software also forecasts the rate at which the birds will grow. This knowledge enables poultry farmers to act quickly and they also know, for example, how heavy their bird will be in 7 days’ time. Smart Farm Assistant gives poultry farmers a new application that keeps them one step ahead of the competition. Every link in the poultry chain has a system that enables farmers to track the condition of their birds or the process itself. Porphyrio stands out from its competitors with an application that can be modified to include each farm’s own business-specific parameters. Smart Farm Assistant also reports more extensively in a way that is particularly easy to use. To sum up, Porphyrio has a great story to tell. So it was up to us to get that story across quickly and clearly so that new customers could discover the strengths of Smart Farm Assistant effortlessly. A whole range of complex algorithms are hidden behind the software. But what the poultry farmer or manager sees is a simple and highly intuitive dashboard. Of course, it’s all about the results and, more specifically, the added value that Smart Farm Assistant can provide the farmer with. So, to summarise the way Smart Farm Assistant works, we created an animated video. The video explains, step by step, how Smart Farm Assistant functions and especially what the results and benefits will be for the poultry farmer or manager in terms of time and efficiency. The video is used on the website, at trade shows and for individual presentations. At exhibitions, Porphyrio shows the video on a flatscreen, enabling visitors immediately to see what Porphyrio has to offer. It attracts additional visitors, too. 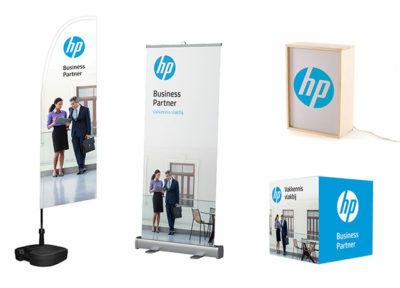 HP makes POS material available to its partners for use in their sales outlets, as well as at trade shows, seminars and workshops. We were asked to come up with a selection of items for HP’s partners to use when they need them. We put together a Point of Sales package. This package consists of various POS items that the partner can select all year round and order on a simple call-down basis when needed. We track the orders, manage stocks and ensure the items are sent out quickly. As a result, HP does not need to concern itself about the continuity of its presence at sales outlets. Blue Water Company leases drinking water coolers to organisations and private customers. The company also handles the delivery of the mineral water used in the coolers. Vendors operating for the Blue Water Company include the sales people of the Smart SN network. The company wanted to create an incentive for this group to act as a motivator to boost sales, giving away an authentic, unique and personal gift to help Blue Water Company stay top of mind. Castel has a UV printer, which we can use to print 3D objects with a maximum size of 53 x 36 x 10 cm. Wood, metal, glass, plastic: everything’s possible. The UV inks are indelible and colourfast. Because we have the technology in-house, we can be very flexible and produce items quickly. 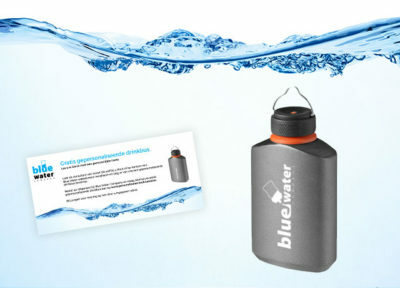 We suggested that Blue Water should reward their reps with a personalised water bottle when they made a good sale. The salespeople could choose what they wanted to have printed on the water bottle: their name, a catchy slogan – whatever. We processed the orders for the water bottles on a weekly basis. HP works together with Marketing Service Agencies (MSA) in all European countries to implement CoMarketing initiatives that it sets up with its Preferred Partners. Castel is HP’s MSA in Belgium and Luxembourg. As an MSA, we align ourselves with the HP strategy and are thoroughly familiar with the partner channel. So we can anticipate and react proactively to the needs of HP and its Preferred Partners in optimal fashion. HP boasts whole series of high-performance, stylishly designed premium PCs, and wanted to put together a package with demonstration devices, supplemented with promotional materials. The target group consists of HP resellers. They can request their package in order to enable their customers to experience the HP premium products during an open house, workshop or other event. To be able to deliver the devices under optimal conditions, we proposed a custom flight case: a rigid case in trolley form. Castel manages the case and follows up the reservations via an online reservation platform that we have assigned exclusively to this service. Managing the reservations includes keeping the devices up to date. Hardware and software alike are inspected thoroughly after every loan. A package of promotional material is sent together with the case. We keep this material strictly separated from the hardware and also package it separately. Part of this material may be kept by the reseller. Castel is responsible for the total management of this aspect, from composition to inspection before shipping. This extensive approach enhances the relationship between HP and its resellers. Bernd Bosch, CEO Blokker Belgium - "Young people were tending not to go to Blokker. That had to change. This campaign gave us a way of communicating directly and personally with this target audience ..."
As an all-round service marketing and communication agency, Castel would like to become an extension of the organisation of its clients to work out a cost-effective strategy in an ethical and responsible manner in order to make them more competitive. Castel can draw on more than twenty years of experience, especially in the business-to-business market, to plan and carry out a wide range of business development and marketing activities. Furthermore, Castel is thoroughly familiar with the management of co-marketing programmes. A careful integration of campaigns into a well thought out marketing mix guarantees a maximal impact. Driven by inspiration, energy and creativity. A good marketing campaign combines a range of different elements to create an effective overall concept. One that fits in seamlessly with your strategy. But how do you make that come true? By working with a partner that keeps a firm hand on the reins for you. Castel is just such a partner. Do you have to restrict yourself to the elements for which we have the expertise, literally ‘in house’? Not at all. Whenever required, we supplement our own knowledge and skills with input from experienced external specialists. But we maintain the overall control ourselves. Which means you retain a single point of contact and can be sure of benefitting from an integrated approach, right down to the tiniest details. Castel is part of the Corvus Communication Group, a growing cluster of partner companies with complimentary activities round marketing, communication and event organisation. This means that Castel is your ideal one-stop shop for total projects on every scale such as an event with catering, entertainment, website, promotion clip, etc. Click here to subscribe to the Castel e-newsletter. Enkel deze voorwaarden beheersen de contractuele relatie tussen partijen met uitsluiting van de voorwaarden van de klant. Indien uitdrukkelijk en schriftelijk voorkeur wordt gegeven aan de voorwaarden van de klant, blijven de hiernavolgende voorwaarden gelden op aanvullende wijze. De geleverde producten, voorwerpen, evenals elk ander voorwerp worden vervoerd op risico van de klant. De opgegeven uitvoeringstermijnen, tenzij schriftelijk anders overeengekomen, zijn enkel benaderend. Een eventuele vertraging kan in geen geval aanleiding geven tot schadevergoeding of tot de ontbinding van de overeenkomst. Elke annulering dient schriftelijk te gebeuren. Bij gehele of gedeeltelijke annulering van de bestelling door de klant heeft Castel het recht op een schadevergoeding a rato van 15 % van de overeengekomen prijs, tenzij de werkelijke schade die Castel heeft geleden ingevolge de annulering hoger ligt dan dit forfaitaire bedrag. In dat geval heeft Castel recht op volledige schadeloosstelling. De verbintenissen van Castel zijn inspanningsverbintenissen. Castel is nimmer aansprakelijk voor schade behoudens indien de geleden schade is veroorzaakt door een opzettelijke fout van Castel. Deze laatste is niet aansprakelijk voor de zware fouten en zelfs de opzettelijke fouten van haar aangestelden. Wanneer de fout van Castel bewezen is, beperkt haar aansprakelijkheid zich tot het crediteren van de factuur. De onrechtstreekse schade, zoals de financiële of commerciële verliezen, winstderving, verhoging van algemene kosten, het verstoren van de planning, het verlies van cliënteel, kan in geen geval aanleiding geven tot schadeloosstelling, zelfs indien Castel vooraf ingelicht werd over de mogelijkheid van deze schade. Voor deze speculatieve opdrachten factureert Castel de door haar gepresteerde uren aan een tarief van 100,00 EUR per uur, vermeerderd met de onkosten die voor de presentatie gemaakt werden, evenwel met een minimum van 15% van de waarde van het geformuleerde voorstel. Het feit dat een voorstel eventueel vrijblijvend gemaakt werd, verandert hier niets aan. Een vrijblijvend voorstel wordt door Castel immers uitsluitend gemaakt indien de opdracht tijdens de briefing een voorwerp heeft. Tenzij anders schriftelijk is overeengekomen, behoudt Castel de intellectuele eigendomsrechten op al haar werken. Voor zover de intellectuele eigendomsrechten worden overgedragen aan de klant, gaat de eigendom pas over na betaling van de overeengekomen prijs. Voor zover de intellectuele eigendomsrechten niet aan de klant zijn overgedragen, verwerft deze een niet exclusief en niet overdraagbaar gebruiksrecht. De klant zal de door Castel ontworpen werken op geen enkele manier tegen vergoeding of gratis ter beschikking stellen van derden. De klant zal, tenzij anders schriftelijk is overeengekomen, de ontwerpen, creaties en door Castel uitgevoerde documenten enkel aanwenden voor het doel waarvoor zij gecreëerd werden. Het is de klant verboden de ontwerpen, creaties of definitief uitgevoerde documenten van Castel te vertalen, bewerken, te ordenen of op welke manier ook te veranderen zonder de voorafgaande toestemming van Castel. Auteurscorrecties zijn correcties die door de klant worden aangebracht op een bepaalde fase van het plan nadat een goedkeuring, al dan niet schriftelijk gegeven is. De gevolgen van de auteurscorrecties vallen integraal ten laste van de klant. Hiertoe behoren de gevolgen van het veranderen van teksten, het aanpassen van mediaplannen en het wijzigen van hoeveelheden. 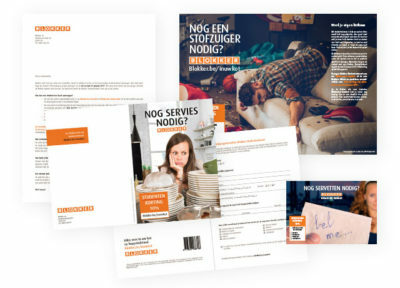 De diensten worden geacht aanvaard te zijn door de klant 8 kalenderdagen na de levering van de geleverde diensten behoudens nauwkeurig omschreven en gedetailleerde klacht die Castel bereikt per aangetekend schrijven voor het einde van de hoger genoemde termijn. De geleverde goederen blijven eigendom van Castel tot volledige betaling van de prijs. Tot aan de betaling kunnen de goederen niet vervreemd worden, in pand of welke danige zekerheid worden gegeven. De facturen van Castel zijn contant betaalbaar, netto zonder korting op de zetel van Castel, tenzij uitdrukkelijk anders werd overeengekomen. Bij gebreke van integrale betaling van de factuur op de vervaldag zal vanaf de eerste daaropvolgende dag van rechtswege en zonder verdere ingebrekestelling vereist, een intrest verschuldigd zijn zoals voorzien in artikel 5 van de Wet van 2/8/2002 op de bestrijding van de betalingsachterstand bij handelstransacties, met name de referentieintrestvoet vermeerderd met 7% en afgerond tot de hogere halve procent, zonder dat evenwel de aldus bekomen intrestvoet lager zou mogen zijn dan 12% op jaarbasis. Ter vergoeding van buitengerechtelijke invorderingskosten en de administratieve werkvermeerdering is er van rechtswege en zonder dat een ingebrekestelling vereist is, een schadevergoeding verschuldigd begroot aan 10% van het achterstallige bedrag met een minimum van 70 EUR vermeerderd met een forfaitair bedrag van 13,00 EUR per aanmaning evenals de eventuele aantekentaks. Indien Castel daarenboven tot gerechtelijke invordering dient over te gaan, zal de klant bovendien alle kosten dienen te vergoeden die door Castel werden gemaakt ter gerechtelijke invordering zonder dat deze vergoeding bij vergelijking echter lager zou mogen liggen dan het bedrag dat bekomen wordt na toepassing van het tarief van de sommen die invorderbare kosten zijn vanwege het verrichten van bepaalde materiële akte, zoals door de Koning vastgesteld in uitvoering van art. 1022 Ger.W. Alle betalingen uitgevoerd door de klant zullen eerst aangewend worden op de intresten die verschuldigd zijn krachtens de huidige voorwaarden, vervolgens op de schadevergoedingen en die invorderingskosten en pas nadien op de openstaande factuur of facturen waarbij de oudste openstaande bedragen ook eerst worden verrekend en dit ongeacht eventuele opmerkingen of vermeldingen van de klant ter gelegenheid van de betaling. In geval van betwisting zijn uitsluitend de Belgische rechtbanken bevoegd, meer bepaald de rechtbanken van het arrondissement waar de maatschappelijke zetel van Castel gevestigd is. Op alle overeenkomsten tussen partijen is Belgisch recht van toepassing.